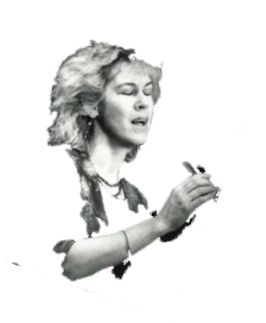 For several years Polly has been facilitating singing workshops. She likes to work with people who feel blocked from using their singing voice, as well as those with more experience. Whilst giving occasional private lessons, Polly's preferred method of teaching is through workshops. She also arranges for a community choir "Larks", a group open to all who enjoy singing or have a desire to sing. Polly also arranges polyphonic arrangements of some of our finest folk songs and writes chants and jazz improvisations. Polly believes we can all sing if we give ourselves permission. The recent interest in voice workshops, singing groups and voice camps helps make that "permission" possible to all. This workshop is aimed at those who want to discover if they have a singing voice or want to improve their ability to sing out. Through breathing, voice placement, opening the throat and resonating, participants are helped to feel the whole-body experience of singing. Improvisation and chants are sung throughout this workshop. Polly has developed this workshop in response to an often heard plea! This workshop is for singing-phobes who are genuinely fearful of singing and for those who love to sing but are constantly being told they can't sing by those around them because they are not "singing in tune". The numbers of people attending this workshop are limited to allow for individual tuition. This workshop is light-hearted but will help to increase technical ability and allow participants to begin to validate their voices. Polly is one of the leading traditional singers in Britain, well-known for her vocal decoration. This workshop is for those who have some experience of singing and want to learn this highly evocative style of melodic singing. Polly will teach various exercises to relax the throat and epiglottis and to use muscles with control in the throat area. She also teaches specific phrases and traditional songs which are rich in vocal decoration. Open to all with a "good ear" for harmony or some experience of close harmony singing. Polly's wide experience of the traditional song in Britain has prompted her to arrange some of her favourite songs, in a sometimes unconventional way, mainly as four part polyphonic arrangements. The parts are taught aurally so there is no need to read music. The centre can also be used as a recording studio and rehearsal space for performers and choirs and is set in the beautiful landscape of the South Shropshire Hills. Please contact us for more information.